It is a truth universally acknowledged that writing a review for a book you love is infinitely harder than writing one for a book you hate. I really, really liked this book. It’s one of those where after I put it down I was like “yeah, it was really good,” and then the more I think about it, the more I realize it was REALLY good. I find it so easy to rant on about things an author screws up, but it is sometimes really difficult to pinpoint what makes you love it. Before I get ahead of myself, the synopsis. I’m actually going to go ahead and borrow (most of) Amazon’s description here because I can’t find the words to condense it into an intelligible description on my own. When Ruby woke up on her tenth birthday, something about her had changed. Something alarming enough to make her parents lock her in the garage and call the police. Something that gets her sent to Thurmond, a brutal government “rehabilitation camp.” She might have survived the mysterious disease that’s killed most of America’s children, but she and the others have emerged with something far worse: frightening abilities they cannot control. Now sixteen, Ruby is one of the dangerous ones. When the truth comes out, Ruby barely escapes Thurmond with her life. Now she’s on the run, desperate to find the one safe haven left for kids like her—East River. She joins a group of kids who escaped their own camp. Liam, Chubs, and Suzume aka “Zu”, have their own past chasing them and their own reasons for wanting to find the East River camp. When they arrive at East River, nothing is as it seems, least of all its mysterious leader. But there are other forces at work, people who will stop at nothing to use Ruby in their fight against the government. Ruby will be faced with a terrible choice, one that may mean giving up her only chance at a life worth living. Not quite fantasy, not quite dystopian, but with elements of each, this book was like an action packed X-Men origins story. X-Kids, if you will. I’ll start with the characters: great, of course. Ruby did worry me at first (as did the book in general) because I was afraid she was going to fall prey to the Mary Sue/Bella Swan trap of just having so many feelings, and being the most super special snowflake in all the land even though she feels like an awkward outsider. Thankfully, we skip that crap. Ruby gets taken from her home when she is 10 and spends her formative years in what are essentially slave camps, so when she is eventually freed, it takes some major adjusting, but adjust she does. As she learns to control her abilities, she gains confidence too, and it’s just really nice to see her grow throughout the book. Liam, Chubs, and Zu are all great as well. Zu doesn’t speak (no one is quite sure if it’s voluntary or not) but she writes and emotes and is pretty much just the cutest. Chubs is the smart, cranky one, but he evolves beyond that and becomes a great character and great friend to Ruby. Liam is the boy scout of the group, strong and optimistic. He’s not the most dynamic member of the group, but I like his role and I think there’s room for his character to grow. By the time the group makes it to East River, I was totally invested in all the characters and was shouting at the book when bad things loomed. The camp’s leader adds a really nice quiet menace to the atmosphere. He seems like he’s a benevolent leader, but there’s some sinister undertones, but are we imagining them? What’s real and what isn’t? There’s even more subplots within the book that add layers of story and complications for our characters, but I don’t want to spoil anything. This was a great first installment of a trilogy, and I’m excited to get started on the next one. 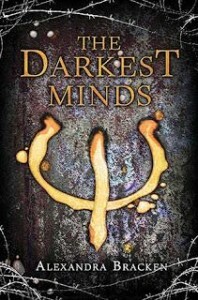 Share the post "“The darkest minds tend to hide behind the most unlikely faces”"
Dear Pierce Brown, I love you, but sometimes I don’t like you all that much. I think this was on my Good Reads list…but I’m moving it up! Thanks! I completely agree about writing a one star review being so much easier then writing a 4-5 star review. Most of the time I can pinpoint why a particular book pissed me right the hell off, but it’s a lot harder to see which things about the book pinged all the LOVETHISSOMUCHEVERYONENEEDSTOREADITNOW buttons. They should just go ahead and make that button real, it would simplify things! For sure. Most of my 4-5 star reviews consist of words that are basically “SQUEE!” but with more syllables. Right? And how many times can you just say over and over READITNOWNOWNOWNOW before someone tells you that phrase is not an actual review.